Many people suffer from dark spots on the skin. Medically, this is known as hyperpigmentation. The large dark spots breakup an otherwise even skin tone and can create a nuisance to those aiming to achieve an overall consistent pigment color. Premier Dead Sea offers a great product to help alleviate the dark spots of skin. Causes are of dark skin spots can vary from sun damage, liver disease, and pregnancies. The Dead Sea Premier Pearl Whitening Cream is meant for to help with all dark spots no matter the cause. 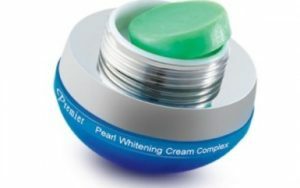 This is accomplished with an exceptionally multi-protective gentle pearl powder mixed in a secret process formula with effective secret whitening herbs, liposome complex, Dunaliella seaweed, Beta-carotene, UVA & UVB sun filter protection. It speeds melanin suppression, moisturizes and refreshes sun – stressed skin. It helps lighter skin emerge as skin translucence is restored. When over exposed to sunlight, the skin defends itself by producing more melanin, a dark pigment. Cell renewal is disrupted and dark pigment builds up in small freckles and uneven sunspots trapped on the skin’s surface. Our secret formula helps restrain excess production of melanin. Gradually freckles and sunspots fade and lighter skin emerges as skin recovery proceeds. The combination of the mineral bar and the cream combine to create a deeply penetrating experience for your skin. The mineral bar is also unique in the fact it stores active ingredients at room temperature and prevents them from oxidizing so that they stay active and fresh for much longer. For application, cleanse the skin thoroughly at night time. Afterwards, take the green mineral bar and massage onto face. Rinse face with water and pat dry (It will take oxygen from the water to your skin). Now, gently massage the cream, in circular soft movements, onto skin. If desired, you may apply makeup afterwards.